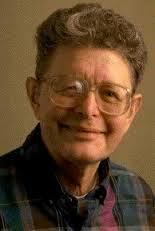 Poul Anderson's contribution to OSS literature is of primary importance for its Jovian coverage. In other words - hey, man, this guy's good on Jupiter. More qualified in science than are most sf authors, Anderson also is happily possessed of the soul of a romantic. The combination is a fortunate one, for anyone trying to write convincingly yet colourfully about life on a high-gravity world. The novella Call Me Joe; the novel Three Worlds to Conquer; and the passage which tells of a visit to Jupiter's Great Red Spot in the Flandry series interstellar adventure, Hunters of the Sky Cave. Poul Anderson has also contributed to the literature of Mars with the pleasant, mellow The Martian Crown Jewels and with his powerful pursuit-tale Duel on Syrtis. 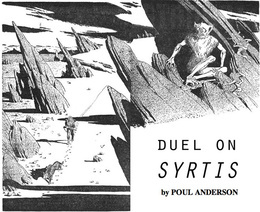 Duel on Syrtis makes you feel what it's like to be an intelligent Martian hunted like an animal by a ruthless Earthman. Kreega shuddered in a sudden blast of wind. The night was enormous around him, above him, from the iron bitterness of the hills to the wheeling, glittering constellations light-years over his head. He reached out with his trembling perceptions, tuning himself to the brush and the wind and the small burrowing things underfoot, letting the night speak to him. Alone, alone. There was not another Martian for a hundred miles of emptiness. There were only the tiny animals and the shivering brush and the thin, sad blowing of the wind. And yet it turns out that Kreega is far from alone. While the Earthman pursues him with the aid of domesticated Martian "hound" and "hawk", the entire native biosphere awakes to the need to help the fugitive. This is not a figure of speech; something out-of-this-world really does happen. The desert, the planet and its wind and sand under the high cold stars, the clean open land of silence and loneliness and a destiny which was not man's, spoke to him. The enormous oneness of life on Mars, drawn together against the cruel environment, stirred in his blood. As the sun went down and the stars blossomed forth in awesome frosty glory, Kreega began to think again. He did not hate his persecutor, but the grimness of Mars was in him. He fought the war of all which was old and primitive and lost in its own dreams against the alien and the desecrator. It was as ancient and pitiless as life, that war, and each battle won or lost meant something even if no one ever heard of it. You do not fight alone, whispered the desert. You fight for all Mars, and we are with you. Anderson also gives us fascinating visions of medium-future and far-future Earth, in The Corridors of Time, The Winter of the World and Epilogue. For the "Martian-influence" novel Shield, see the OSS Diary for 16th January 2017. For a dawn scene on Anderson's Jupiter see the OSS Diary for 22nd February 2017. For the Jovian rainstorm, and authorial comment, see The Author's Voice-Over. For a far-future Moon see the Diary for 17th May 2017. For Anderson's views of Mars and Jupiter in The Byworlder, in which an alien from Sigma Draconis explores the Solar System, see Anderson on Tour - Lyrical but Compressed. For the view of Jupiter from its innermost satellite in Call Me Joe, see Amalthea. For a comparison with Bradbury see Venus - The Long Rain and the Big Rain. Extracts: see Jovian ground-dweller among sky folk and Heavy weather on Jupiter.